Sun, sand, and movie stars. What more can you ask for from a vacation spot? Vacationers heading toward the Los Angeles area can discover some great places to visit including a few local things that you should know about. Enjoy your trip more with these tips and ideas on rides to and from the airport. When you vacation at your favorite sport in L.A. you can ride with a variety of local providers who can get you to your destination whether it is by limo buses, luxury sedan transfers and the ever popular shared ride vans. Discover the many types of vehicles and styles our local shuttle providers have to offer near LAX airport. When arriving in Los Angeles you can find a variety of shuttles to choose from such as shared ride vans and private vans that you can book. With room enough to handle up to 9 passengers in their shared ride vans this Blue Van service offers exceptional service and professional chauffeur assistance for passengers. With all-inclusive fares and longer wait times that is complementary to its passengers, Blacklane gives its customers first class LAX airport transfers. A popular black car service in Los Angeles that has low fare and courteous chauffeurs to give you a relaxing ride to your destination. 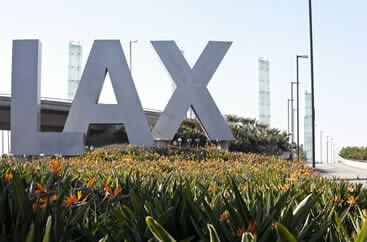 With just under 50,000 employees at LAX airport this considered one of the largest airports in the United States. There are many places tourists can unwind at LAX such as in the Bradley Terminal at the reLAX Lounge or you can go to the nearby burger restaurant at In-N-Out which is popular among seasoned travelers. LAX offers more for travelers such as its more than twenty thousand parking spaces available to park at as well at spaces at The Parking Spot that offers remote parking. This airport is one of the largest and busiest ones in the whole of the United States and offers convenient shuttle rides to the Port of Los Angeles. Its unique architect, amazing interiors, and high LAX letters on the entrance make your visit here quite a unique experience. Though it is a huge airport and hosts a lot of traffic on a daily basis, the services here are very quick. Easy security checks, fast processing lines, and good food options make it a good choice of airport. Although the services are quick, you should still reach early as there could be delays due to the rush of people. The airport services are controlled by multiple airline companies and each company offers its services separate from the other. So, there is a competition between these companies to provide better services compared to the others. As a result, customers enjoy top-quality services at highly discounted rates. Of the many things which will make your travel here quite remarkable, one is the flight over the Pacific Ocean. The airport is located adjacent to Dockweiler Beach. Both during landing and take-off, the flight gets very close to the sea, giving you a lifetime experience. The airport is present at a few minutes’ drive from the Los Angeles city. If you’re on a connecting flight and you have a stay here, then you will find many entertainment options here. You can either spend your time on the beach soaking up the sun, or you can roam around the beautiful city itself. Los Angeles International Airport is by far the largest and busiest in the great L.A. area, and because of this, ground travel becomes incredibly vital once you land. Los Angeles is known for its tremendous size, and as a consequence, sometimes-infuriating traffic. Before you stress yourself out renting your own ride, leave the hard-work to the driver of SuperShuttle and Prime Time Shuttle many shared ride vans, which offer pickup and delivery. With a vintage carousel that belts out beautiful carnival music and trails that go on for miles, Griffith Park is a staple of the city and an easy way to spend an afternoon. Take everyone in your party by booking a well-sized vehicle. With the speed and efficiency of a private van versus public transportation, you’ll not only be arriving on your own time, but on-time as well. Go for a star-studded walk down the infamous Hollywood Walk of Fame by booking a private sedan and parking along Sunset Boulevard. Be sure to reserve your ride with us by checking out other nearby locations like the landmark TCL Chinese Theatre, a highly tourist-heavy area that is typically prone to sudden celebrity pop-ups as well as quirky, but fascinating Hollywood tours. If the Hollywood scene doesn’t fit your taste, see high-class art exhibits at Getty Center, a free venue celebrated for its diversity. For families that want something a little more out of this world, skip the cheesy theme parks and check out the historic Griffith Observatory, which is home to an astounding planetarium with telescopes, city views, and glimpses into far-off galaxies. The observatory is first-come-first-serve so be sure to get to the coveted hotspot by reserving a private SUV, courtesy of area providers. Los Angeles is home to some of the world’s biggest stars, making the food-scene as famous as the people that eat there. If you’re in town, visit Trois Mec, a delicious French spot with compact seating and a global menu. Arrive with a luxury stretched limousine from LAX airport by visiting other nearby luxury landmarks such as the Sofitel Los Angeles at Beverly Hills, an upscale hotel that is not only a great place to spend the night, but have tasty cocktails, go to the spa, and enjoy fine desserts to boot. Whether you find theme parks cheesy or downright fun, not many people can complain about the original Disneyland, which his home to 8 famously-themed lands as well as countless iconic characters that constantly wander the park. Visit the one of a kind landmark by reserving a fun and spacious chartered bus. Chartered buses are the perfect vehicles for transporting mass amounts of people, whether it be your college fraternity or elementary school outing, so if you need four wheels for too many people, call us today. Like many cities, Los Angeles has something to do for everyone. There can be more to do in Los Angeles because of it being a wide area and having so many surrounding cities. You can discover Los Angeles and find new ideas and places to see while you are in town. If you are planning to spend some time in sunny Los Angeles chances are you’ll need an airport ride from LAX airport to get you to your final destination in this sprawling metropolitan area. While you are in town make the most of your trip by not taking chances on your airport ride. We’ve all heard the horror stories (or possibly lived them ourselves) about people being stranded at the airport because of poor planning or lack of planning. If you are looking for parking in Los Angeles there are many options available to you that you need to know about. Many travelers find parking here confusing. If a parking space is red it means you cannot park there. If you are needing a space for a short time then you may want to use the green spaces while blue spaces are strictly for disabled permits. If you are quickly picking up someone or dropping off mail somewhere then the loading zones are marked white. Yellow parking spaces will have a posted time limit to drop off passengers or boxes. If you decide to rent a car rather use a local taxicab provider then you should try to steer clear of Interstate 405 as it is one of the busiest and most congested roads in Los Angeles. There are many alternative routes so unless you have no choice you may want to consider another way. If you are going to be in West Hollywood during your trip and love the outdoors then a simple hike down Griffith Park, Canyon Park, Studio City and Fryman Canyon is right up your alley. If you are looking for more tips about planning your trip to L.A. you can browse through Discover Los Angeles and learn about the many places you can visit and dine at while you are visiting the Los Angeles area. Drop by the Natural History Museum of Los Angeles County by airport taxi and see the wonders of our past. The museum features dinosaurs and many other exciting things to do with your children. You can even view a complete Woolly mammoth skeleton that was accidentally dug up during construction. By simply searching through our discount rates for airport shuttles, sedans, airport limousines, taxis and airport buses and booking your reservation ahead of time you can make sure this doesn’t happen to you once you land at one of the area’s many convenient airports such at LAX, SNA, ONT, BUR or LGB. No matter which airport you fly into or where you need to get to once you land we can help make sure you get them on time and in one piece with as little stress as possible so that you can enjoy your trip. In Los Angeles there is certainly no shortage of movie stars, mansions, sunny beaches or fabulous hotels. If you’ll be making one of L.A.’s resorts your temporary home away from home on your next trip you’ll need to know how to get there so booking your airport transfer ahead of time will save you time and more often than not, money too. Los Angeles has a wide variety of some of the most enjoyable hotels in the world but it’s important to know the area you’ll be staying in when choosing your airport ride. For instance, you can book a private limousine to take you to your stay at the Omni Los Angeles Hotel at California Plaza in the downtown Los Angeles area right near the Museum of Contemporary art. You may also prefer taking a private shuttle van to the Tilt Hotel Universal Hollywood located next to the Hollywood Bowl amphitheater and Griffith Observatory. If you are looking to stay closer to the airport, you can book a shared shuttle to the Courtyard Los Angeles LAX Century Boulevard. If you’ll be here taking a vacation with your friends or with your family one problem you won’t have is running out of things to do. Once you arrive at the airport if you are planning to get your vacation started right away you can book your airport transfer to take you to Disneyland in Anaheim, Knott’s Berry Farm in Buena Park or the Hollywood Walk of Fame in Hollywood. If you’re in town on business and need to get to the LACC or Los Angeles Convention Center from the airport for your next convention or trade show simply search, select the best option for you and book your airport ride and you’ll be there in no time.